The participants need to click, upload and share their entries on their Facebook, Instagram or Twitter profile/page using the hashtag #DiwaliApnoKeSaath and #ALLENKota. 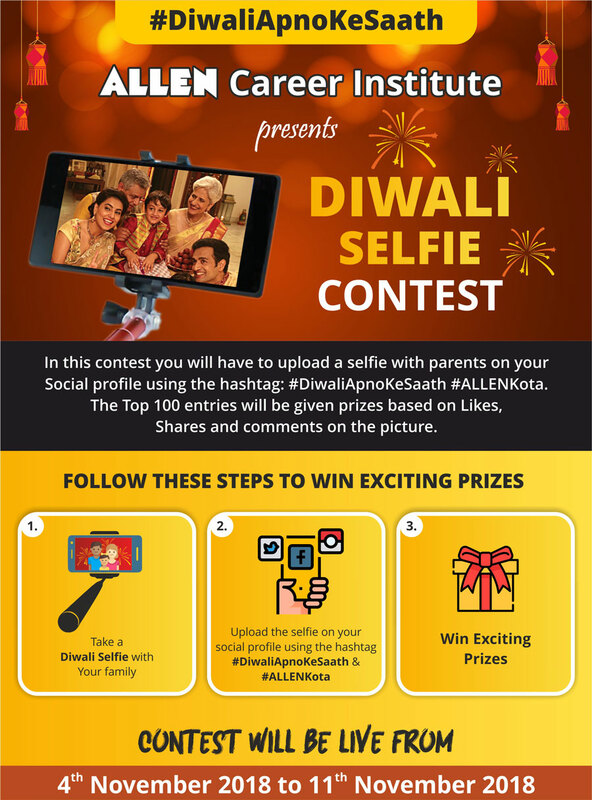 In this contest you will have to upload a selfie with parents on your facebook account using the hashtag: #DiwaliApnoKeSaath #ALLENKota. The entries should be theme based i.e. should include a glimpse of Diwali Decoration/Celebration. The Top 100 entries will be given prizes based on Likes, Shares and comments on the picture. This Contest is Open for Indian Residents only. The Selfie should be taken with your parents/guardians. The entries should be theme based i.e. should include a glimpse of Diwali Decoration/Celebration . The top 100 winners will receive surprise gifts from ALLEN Career Institute, Kota. Spamming is not acceptable; anyone intending to do shall be blocked from this page for ever. Decision of ALLEN will be final regarding the Winners of The Contest. There should not be any mistake in the spelling of #DiwaliApnoKeSaath. Name of the Winners will be posted on ALLEN Kota facebook page by 15th November 2018. To send surprise gifts to Winners, contact details will be asked and verified after the declaration of result. ALLEN Career Institute 2015-16 © All Rights Reserved.